The BC-157X Vesper Fighter does everything the BC-145X Micro Fighter does much better. It is a small, cheap, and well-armored midget plane with a powerful punch. 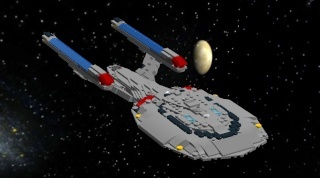 It is armed with two wing-mounted phaser emitters and two fuselage-mounted photon torpedo launchers. Compared to the BC-145X Micro Fighter, the Vesper is overall more heavily armed and is much more armored, rigid, and durable. It also handles better and has a higher top speed and ceiling height, as well as better fuel economy and range. With its photon torpedoes, rocketing speed, and midget plane agility, the 157-X Vesper can hit hard and hit fast, maneuvering easily in the face of new events and quickly shooting in and out of the battlefield. We will sell to the PCG. Give us your pizza! Very nice fighter, Talmid! It's perhaps.... smaller.... than I would have liked, but that's kinda the nature of these tiny fighters, isn't it? I suppose that sums it all up very well- it's pretty good overall, I'm just not a huge fan of the "atmo-only tiny fighter" type stuff- though I have to say, it's a vast improvement over the other fighter pictured. Looks like a great low altitude air-support craft, as in something of a cross between a STAAP and a typical ground attack craft, like one of the ugly alien speeder things from the avengers. ...yeah. anyways, I like it! Deffinitly an improvement over the earlier one. Very cute looking. It looks like a craft that'd be available for civilian purchase and use, not military. This is a good thing. We could use some more civilian ships in our factions! To modify an Avengers quote: "This ship is so adorable; and tiny."